1.Preheat oven to 350 degrees Fahrenheit. Spray a cookie sheet with cooking spray. 2. Combine brown sugar, peanut butter, honey, butter, and vanilla in a small bowl. Microwave in 30 second increments until all ingredients are melted. Stir until smooth. 3. In a large bowl, combine the oats, almonds, and cinnamon. Add the wet mixture to the dry, and stir until combined. 4. Bake for 15 minutes, and then “stir” or “flip” the granola with a spatula. Bake 3-5 more minutes, or until browned. 5. Remove the granola from the oven and let it cool completely. 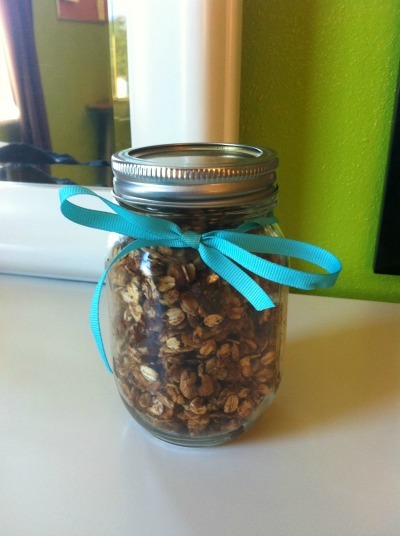 Add chocolate chips and raisins to granola and enjoy!